Displaying news articles 31-32 of a total 32. 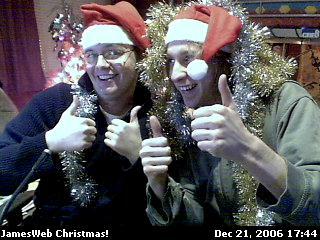 Well, there you go, the Live Online Christmas tree is back in it's box for another year, and now we can sit back and sip all our glasses of sweet, sweet 2005. There's a new Facegary going around, in case you didn't notice... Don't be scared of it, even if you don't like it at first, watch it three times*, it's the greatest thing you've ever seen. ... Damn, I really need to put more on this site, it's empty without Christmas! Welcome to the brand new JamesWeb! It's the one we've all been waiting for, (and by we, I mean I), it's JamesWeb! And it's all shiny and new, and just in time for Christmas, too! And that rhymed! Best time ever. The benefits of a 'groovy' new site are plentiful, and as well as a few new site features, there's a whole pile of new content that's been waiting to be released... So here's a bulleted list. Facegary - The first episode of a new series, which is all a little... Different. Try it out, see what you think. Garth And Cliffe's Hotel 4 - Two years in the Making, the GACH brothers (are they brothers?) return! Cat-O-Blue Guest Director: Xanni - Previously unseen on JamesWeb, Xanni's tribute to the Cat Of Blue. Live Online Christmas Tree - The tree is back for it's second year! Be sure to be here to witness the unveiling at 8PM (JamesWeb time) on the 6th December! Christmas Bobby's House - Bobby brings us this year's JamesWeb Christmas special, searching for a delicious turkey dinner. It's a corker. John The Multi-Coloured Singing And Dancing Snowman - This is embarasing, but I figured it'd be fun to upload a bit of nostalga for Christmas... That's from 1999, and the 2000 version's up as well. All this can be 'gotten to' through JamesWeb Christmas Land, but... What's the point when I just gave you links right there? That's all for now! Enjoy the new site, and don't be a fool this Christmas, feed the parrot.